Great for breakfast ... or, add brown or black beans and corn for a main dish alternative. Prepare rice according to package directions. While rice is cooking, cook sausage in large non-stick skillet over medium high heat. Break up sausage and stir occasionally. Cook for 12 minutes or until done. Drain and keep sausage hot. In same skillet, cook onion 2 minutes. Add tomatoes, sausage and cooked rice and heat thoroughly. 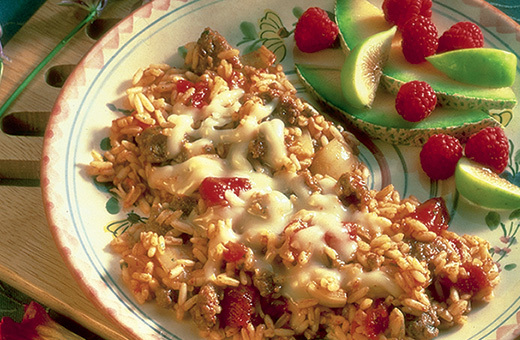 Top rice and sausage mixture with cheese. RECIPE IDEA: To make this a main dish recipe, add a can of drained brown or black beans. And, or, add a can of drained whole kernel corn.